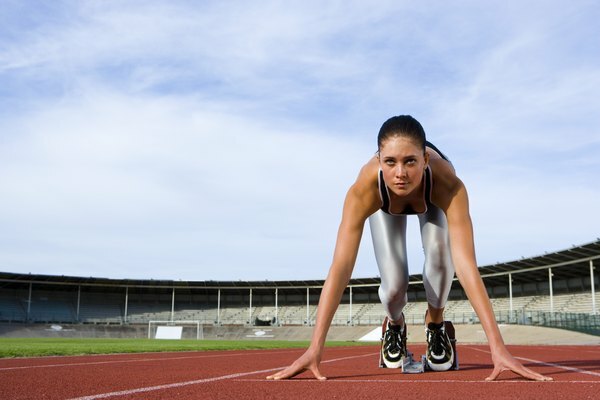 Sprinting is an anaerobic exercise that produces a lot of lactic acid. There is a pervading myth in the fitness industry that lactic acid is an enemy that seeps into your muscles during strenuous exercise to wreak havoc and ruin your entire workout. While lactic acid does have some unpleasant effects during an intense workout, it is not responsible for the steady ache you feel deep in your muscle tissue after you're done. When your body performs work during exercise, it requires an energy source to keep it going. Ideally, the air you breathe is all the energy your muscles will need to fire, but when you turn up the intensity, you also turn up the need for more fuel. Once you push yourself into the anaerobic work zone, your ability to take in oxygen is exceeded by your effort. When this happens, your muscles produce energy anaerobically, breaking down glycogen stores and producing lactic acid as a result. Most people are only capable of keeping up a continuous period of anaerobic exercise for 1 to 3 minutes at a time. This is because your muscles contract faster and more forcefully during a sprint than a jog, producing more lactic acid in the process. Lactic acid contributes to the burning sensation you feel during exercise, but it's actually meant to slow you down and prevent injury rather than cause pain and discomfort. Since lactic acid builds up in your muscles during strenuous exercise, it is sometimes blamed for the severe ache you feel in the days following a tough workout. Current research shows that this isn't the case. 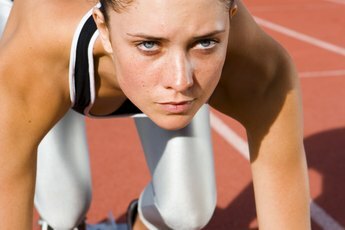 According to "The New York Times," lactic acid is actually seen as an important fuel source for the body by modern sports coaches. The true culprit of that pesky ache that plagues you 3 days after a hard workout, also known as delayed-onset muscle soreness, is microscopic damage to your muscle tissue. 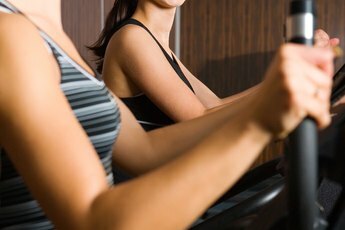 Intense exercise requires more muscle contractions than aerobic exercise. More blood is pumped to your working muscles and fatigue sets in, resulting in minor injuries that don't get a chance to fully heal for some time following a burnout training session. These minor tears are a normal part of the muscle-building process. Damage to satellite cells in your muscles promotes the growth of new muscle tissue, but you'll need to lay off strenuous exercise for a few days to recover. American Council on Exercise: What Causes Muscle Soreness and How is it Relieved?